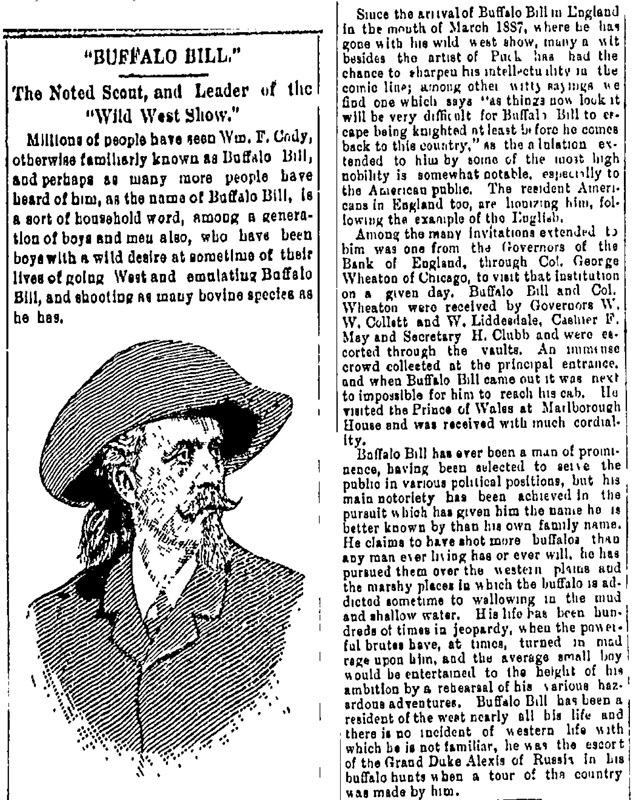 Title: "Buffalo Bill" | The Noted Scout, and Leader of the "Wild West Show"
The Noted Scout, and Leader of the "Wild West Show"
Millions of people have seen Wm. F. Cody, otherwise familiarly known as Buffalo Bill, and perhaps as many more people have heard of him, as the name of Buffalo Bill, is a sort of household word, among a generation of boys and men also, who have been boys with a wild desire at sometime of their lives of going West and emulating Buffalo Bill, and shooting as many bovine species as he has. Since the arrival of Buffalo Bill in England in the month of March 1887, where he has gone with his wild west show, many a wit besides the artist of Puck has had the chance to sharpen his intellectuality in the comic line; among other witty sayings we find one which says "as things now look it will be very difficult for Buffalo Bill to escape being knighted at least before he comes back to this country," as the adulation extended to him by some of the most high nobility is somewhat notable, especially to the American public. The resident Americans in England too, are lionizing him, following the example of the English. Among the many invitations extended to him was one from the Governors of the Bank of England, through Col. George Wheaton of Chicago,  to visit that institution on a given day. 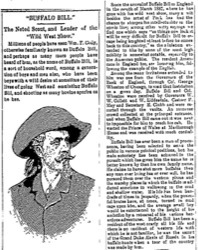 Buffalo Bill and Col. Wheaton were received by Governors W. W. Collett and W. Liddesdale, Cashier F. May and Secretary H. Clubb  and were escorted through the vaults. An immense crowd collected at the principal entrance, and when Buffalo Bill came out it was next to impossible for him to reach his cab. He visited the Prince of Wales at Marlborough House  and was received with much cordiality.